This is an image of the Great Harp of Ireland, sometimes called Brian Boru's harp.The harp dates from the fourteenth century, later than Brian Boru's death in 1014. The harp's soundbox is carved from a solid piece of willow and the harp has twenty-nine brass strings. It is the harp on which official images of the harp emblem are based. The harp was presented to Trinity college in 1782. 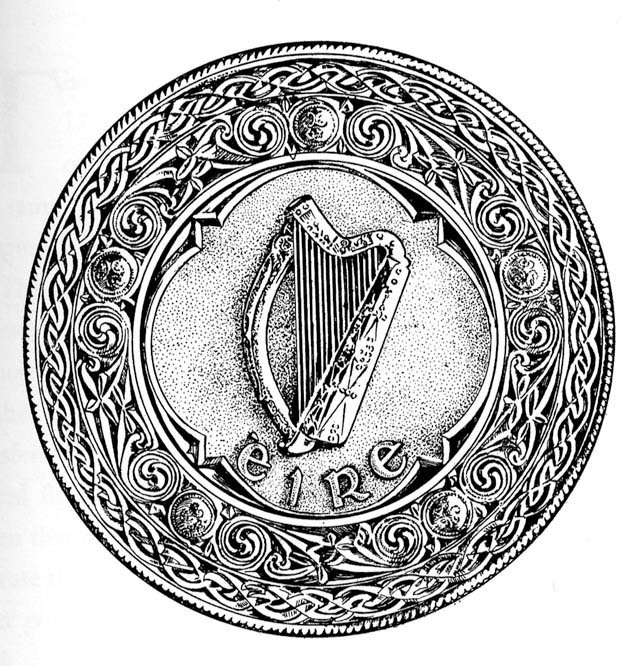 The Irish Free State (6 December 1922 – 28 December 1937) used the harp on their official seal. This harp was a representation of the Trinity College harp lending the image authenticity. The Trinity College harp, once thought to have belonged to Brian Boru, has been dated to the fourteenth or fifteenth century. Little is known of its early history. William Conyngham of Slane Castle presented it to Trinity college in 1782. 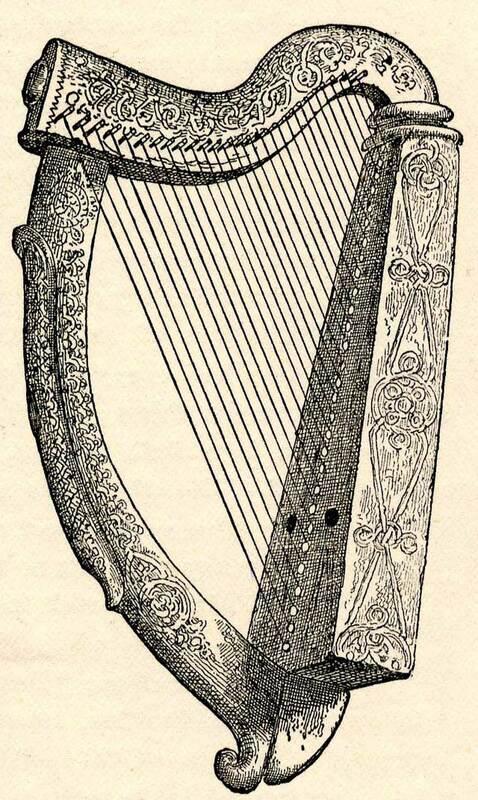 It is one of the very few small low-headed Irish harps, used up to the sixteenth century, which has survived. As with all early Irish harps it is made of willow with a hollow soundbox carved from a single piece of wood. The harp was leaned against the left shoulder and the strings were plucked with long fingernails. William Butler Yeats chaired a committee to advise on the design of the Irish coinage which was to start circulation in December 1928. The English sculptor Percy Metcalfe won the design competition and his interpretation of the Trinity harp featured on the obverse of coins and became the model for further official interpretations of the harp emblem. The harp emblem is always shown at a slight angle to show the soundbox and its design, slightly foreshortening the harp. Frequently the number of strings on official harp emblems varies. The procedures associated with the state seal are set out in the Presidential Seal act (1937). This seal retains the Free State seal design with Saorstát Eireann changed to Eire and has 15 rather than 18 strings. The Presidential standard is the flag which flies over the Árus when the President is there, and, when appropriate, over other buildings to indicate the President's presence. The harp in gold, a replica of that on the Presidential seal and with 15 strings, is shown on an azure background. This is the presidential seal of Ireland devised in 1937 and still in use in this design. The harp, Ireland's national symbol, is based on the great Harp of Ireland in Trinity college, sometimes called Brian Boru's harp. The impetus for introducing a national coat of arms came from Edward Mac Lysaght, the first head of the Genealogical Office. The harp, yellow with white strings was officially registered as the coat of arms in November 1945. Controversy broke out on the number and orientation of the strings and a new drawing was prepared showing thirty strings and an orientation of the harp which caused them to be vertical. This was approved in June 1947 and has been used since as the basis for all official representations of the harp although purists regard it as a lop-sided depiction. Despite the formal adoption of the coat of arms the plain, uncoloured drawing of the harp continues to be used as the state emblem. Today the harp emblem appears on naval flags, on courthouses, post offices and Irish embassies. Other state organisations, such as the National Gallery and the Central Bank have adopted official devices based on the state device. The familiar and immediately recognisable Irish harp, so long a symbol and icon for Ireland, continues to be used creatively and like harp music itself, resonates with meaning for Irish people. The great harp of Ireland in Trinity College, also sometimes referred to as Brian Boru's harp, is used as the model for the harp that represents Ireland on all Irish coinage. This coat of arms was devised in 1947. It caused much controversy due to the design and orientation of the harp and the strings.